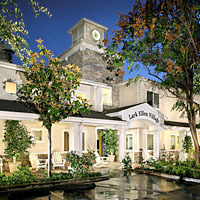 Lark Ellen Village is a 122-unit, tax credit property located in West Covina, CA. The property offers one and two bedroom units for people 62 and over, and two, three and four bedroom units with no age restrictions. This property accepts Housing Choice (Section 8) and VASH vouchers. Lark Ellen Village is currently only accepting applications for the age-restricted (62+) one and two bedroom unit waiting list. The waiting list with no age restriction is currently closed. Each unit includes a stove, refrigerator, waste disposal, central air conditioning and heating, wall-to-wall carpeting and vinyl flooring, window blinds, patio/balcony, smoke detectors/fire sprinklers and controlled access building intercom system. This beautifully landscaped property includes a pool and spa, a senior lounge, a computer lounge with 5 stations, and a community/recreation room that features a large screen television, a billiard and ping-pong table and community kitchen. The on-site staff organizes numerous events including weekly bingo, quilting classes, crafts, movie day, dances, pool parties, and monthly birthday parties.